Training Tips That Really Work. Progress in the gym stems from the combination of a number of specific training variables, and there are many things one must do before they witness results. If one is not achieving their training objectives, invariably they are overlooking certain fundamental gym precepts. Exactly what does it take to maximise gym results? What are the, often overlooked, factors people should be aware of as they engage with the weights? I will endeavour to answer these questions in the following article. These, and other, results, obviously will not be instantaneous, but should occur over a reasonable period as a natural consequence of correct training. Correct weight training includes attention to all aspects of every set of every session. In other words, there should be a high degree of consistency inherent in every program. However, there are many who spend half their lives in the gym, and achieve little in terms of measurable results. These are the people who train extremely diligently, yet tend to do the same thing, follow the same pattern, from session to session; consequently negating their training efforts. Although one might train with good intentions, if they fail to take advantage of certain training requirements, their efforts will amount to very little. This coupled with advice from well meaning, but similarly misguided individuals, inevitably results in stagnation. Almost anyone can enter a gym and lift weights, but the those who observe the best results, typically pay attention to all aspects of their training. Seemingly small changes to ones program can produce large results, and mindfulness when it comes to the specifics of training pays off big time. Attention to detail really does significantly separate the gainers from the non-achievers. With that in mind, the following, often overlooked, training tips, might just help to hasten ones training progress. 1: Squeeze On The Concentric Phase. When contracting a muscle concentrically, it is important to squeeze every fibre to its fullest extent. Often, lifters will simply push the weight, while focusing on the next repetition. This takes the emphasis off the current rep, and compromises the entire set. Really focus on every repetition, in turn, and squeeze the muscle at the top of the movement. Squeezing the muscle forces more blood into the fibres, thus causing a greater degree of micro-trauma. These factors result in significantly greater muscle hypertrophy (growth). The essence of any set is continued pressure on the muscle being worked. A failure a squeeze at the top of the movement means a drop off in terms of resistance, and a consequent reduction in intensity - exactly what is not needed when aiming to build mass. 2: Focus On The Negative. Negative is a word that is not included in the dictionary of most bodybuilders, as it conjures up images of failure. However, when it comes to lifting weights, the negative contraction of the rep (or the eccentric phase) could be the single most important factor in facilitating muscle hypertrophy. The negative phase (when the muscle is being stretched, or lengthened) causes a greater degree of micro-trauma than the concentric phase (when the muscle is being shortened). Provided adequate nutrition and rest strategies are in place, micro-trauma is the best facilitator of growth. Indeed, before the muscle can grow it must first be subjected to unaccustomed stress - the type of stress that causes muscle break-down at the cellular level. To accomplish this, emphasise the negative phase. The idea here is to aim for the greatest possible stretch, before squeezing the muscle concentrically. It is interesting how many people just push their weights up and let them drop, without really focusing on the eccentric and concentric phases - two variables that determine whether a set will be successful in accomplishing muscle growth. Do You Concentrate Enough On The Eccentric Phase? Yes, I Aim For The Greatest Possible Stretch. No, I Just Let The Weights Drop. To achieve a sufficient negative and concentric contraction, it goes without saying that the weight must be controlled throughout the entirety of the movement. Swinging and/or jerking the weight will result in an inconsistent workload placed on the muscle, and a resultant failure to achieve the correct amount of muscular overload. Maintaining muscular tension throughout the movement cannot be emphasised enough, as it is during this process the muscle is actually working. A slow (although not super-slow), steady, and controlled pace should ensure adequate muscle stimulation, and consistent results. An optimal weight to ensure muscle control would be something heavy enough to stimulate the muscle, yet light enough to enable the lifter to maintain sufficient coordination and balance. Tarrying with the negative of natural gravity and one&apos;s own body weight is positive in bodybuilding for fitness. Get the logic of it right here. By focusing on muscle control while aiming to perfect the concentric and negative phases of the movement, one will probably find the amount of weight they ordinarily lift to be too heavy. Generally speaking, by throwing weights up, and letting the joints ligaments, tendons and supporting muscles do the majority of the work, one is better able to lift a considerably heavier weight compared to that of a strict, controlled, movement. However, by controlling the weight, and stretching and squeezing on the negative and concentric phases respectively, results in muscle size and quality will come faster. Working to failure typically means pushing the muscle until it cannot complete another rep. A mistake many lifters make is to stop short of failure, and, as a result, their muscles are not forced to adapt to the extreme stress which accompanies the final few reps of a set. It is often said, the first few reps of a set merely serve as a warm-rep before the real working reps, which come towards the end. I would bet that most lifters, if forced to accomplish an additional rep, could. Indeed, the only thing preventing many from pushing their muscles to exhaustion is the pain associated with lactic-acid build-up. When a muscle is pushed to the limit, it produces lactic acid (a by-product of anaerobic metabolism) when sufficient amounts of oxygen cannot be supplied fast enough, for these excessive demands. The muscles eventually give out as a result. An obvious way to counter this problem would be to obviate lactic-acid build-up. An excellent way to do this is to repeatedly expose the muscles to a high level of lactic acid, as this will help them to adapt to the associated pain (Sheett, 2004). If the muscles do not become efficient at handling and processing lactic acid, levels become too high during exercise, and this leads to premature muscular fatigue, as noted. One could always power through the pain regardless. This approach though, is hard, and often impossible. There is a more efficient way: decrease the rest periods between training sessions. Shorter rest periods between sessions, force the muscles into processing lactic acid at a faster rate. This enables it to be more efficiently cleared from the blood when training time rolls around. Unfortunately though, there will always be some pain associated with heavy training. Tolerating this pain will help to ensure that sufficient intensity is present throughout the session, with muscle growth being the result of this intensity. Decreasing the rest periods will help the body rid itself of much of the lactic acid that accompanies the final few reps.
Due to muscle growth occurring outside the gym, it is important to include rest days in ones program. Perhaps three days on, with the sessions closely spaced followed by two days off will help with both lactic acid dissipation and muscle growth. Experiment with this one. Also, pushing through the pain barrier should be encouraged, not discouraged (Interestingly, from a practical point of view, this variable could be the easiest to control as no special expertise is required, just a large dose of will-power, and effort). Correct breathing, although not exactly classed as an advanced training technique, is immensely vital as it supplies the hard-working muscles with the oxygen they need to continue this work. Although the muscles produce lactic acid, and the body works anaerobically during resistance training, oxygen remains one component of this process. Not breathing correctly will also raise blood pressure and reduce strength - two variables that will serve to compromise health and training results. When it comes to breathing properly, one should always exhale during the exertion (positive) phase of the movement, and inhale on the eccentric (negative) phase. Never hold the breath at any time. This could cause, at the lower end of the scale, dizziness and fainting, and at the extreme end, a heart attack, hernia, or stroke. In fact, given the importance of proper breathing, it would be wise to consider it in the same light as exercise technique, reps, sets and the amount of weight lifted. It should be given equal attention. Training with a view to maximising bodybuilding progress comes at no small cost. To make the improvements necessary to dominate the competition, or for the personal satisfaction that comes from realising good health, the muscles must be subject to the exact right conditions. Anything less will lead to sub-standard results. Focusing on the eccentric (negative) and concentric (positive) phases of a movement will provide the muscles with the required stimulus they need to reach their genetic potential. Controlling the movement will ensure that sustained pressure is exerted on the muscles, causing them to more efficiently reach failure, via overload. Training to failure is vital in terms of forcing the muscles to adapt to a greater training stimulus from session to session. Failure means greater muscular recruitment, and enhanced growth. Finally, breathing properly should never be overlooked. Holding ones breath is often encouraged in the gym as a way in which to exert maximal pressure on a weight. This approach is highly dangerous, and should not be practiced. Correct, rhythmical, breathing will ensure the muscles receive sufficient oxygen, and improved health and well-being will be the result. Putting these factors together will certainly enhance the quality of any training session. 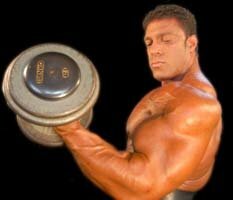 Sheett, T.(2004).Get dense: lift more weight, complete more reps and build thick new muscle in the process with this advanced technique. Muscle and Fitness. Dec.